Complete systems are 50-State smog legal per CARB EO # D-213-28. 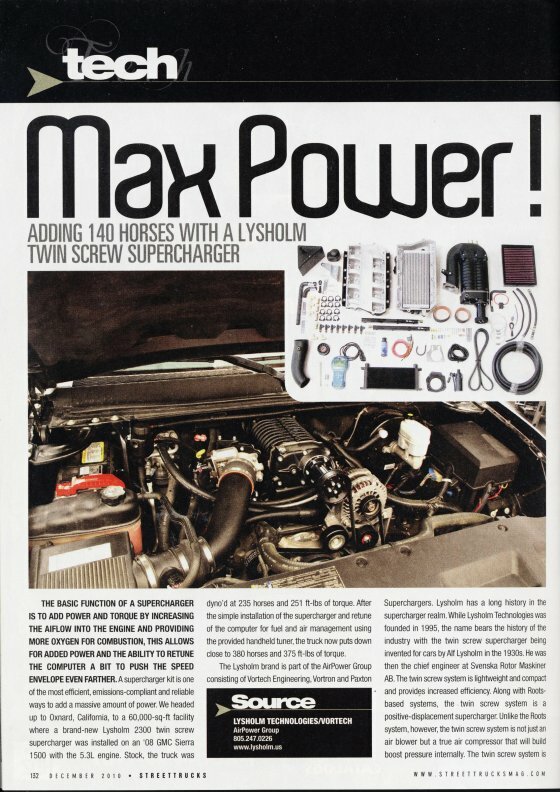 The complete supercharger system will boost your stock 5.3L truck/SUV to 452HP and 444 lb/ft torque with 8.5 PSI from the Lysholm 2300 supercharger at the factory redline. This is an increase of 137HP and 106 lb/ft torque over the GM factory ratings. 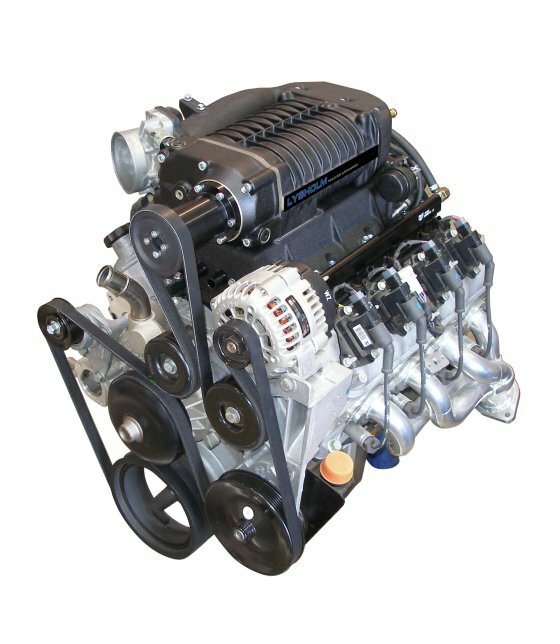 Complete systems for 2012 truck/SUV and 2007 "Classic" trucks are under development. Fuel management upgrade includes a hand-held programmer (controls ignition timing and fuel enrichment), extruded aluminum replacement fuel rails, high-flow fuel injectors and braided stainless steel fuel hoses. 3-Year/36,000-mile powertrain limited warranty optional(term is from vehicle original in-service date). Suggested retail price is $6250.95. Due to the fuel system design on this vehicle, special ECM reprogramming will be required when additional aftermarket parts are added, such as smaller supercharger drive pulleys, large diameter headers/exhaust etc. These systems are not compatible with Flex-Fuel trucks. Complete systems include a fuel management/calibration upgrade and will bolt onto stock vehicles without the need for additional parts. Download Installation Manual (PDF, 33MB): 4LGL020-010 v5.0. Depending on the crate motor, accessories (pulley offset) or vehicle, we offer basic kits for 2005-2009 LS1 truck FEAD and GM LS1/LS2/F-body/GTO FEAD custom installations. These basic kits do not include external charge cooler components (water storage tank, hoses, clamps, pump, and heat exchanger) and may require significant hood modifications. Call for more information. Download Installation Manual (PDF, 13MB): 4LGL020-015 v1.0.